So, Cranky’s K gets to spend another day or two in the spa, getting its valves ground, but hopefully when they put it all back together to check the clearances, it’ll be as close to perfect and ready to go as possible! Next step – rings/gaskets/seals and strapping things back together. Oh, and its BEAUTIFUL after the cleaning they did! I’ll take some pics once its back, to show off how gorgeous it is! Perfectly machined valve seats, a crosshatching to DIE for in the cylinder, and everything so spotless even LTGal would touch it! 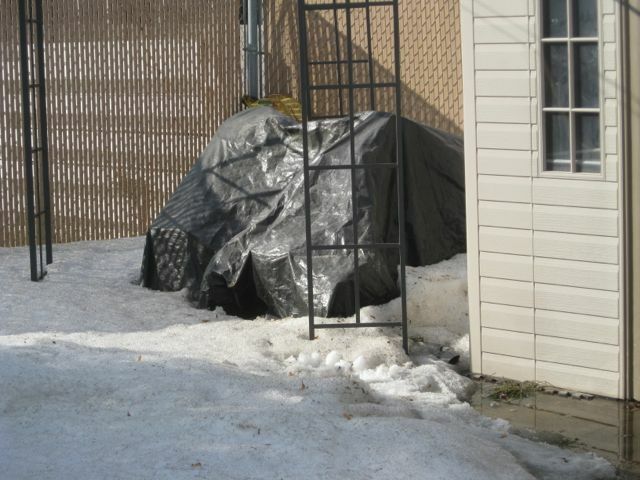 Only another 4-5 inches of snow to melt before I can get the tarp off Wally and start reassembly! (I really hope that, when I finally pull that tarp off, those are actually still TRACTORS under there…. Not that some varmint has come, stolen away my tractors and replaced them with a big pile of, oh I dunno, acorns or something!). This entry was posted in Wally and tagged Cranky, John Deere 110, John Deere tractor 110, Kohler K181, Wally. Bookmark the permalink.